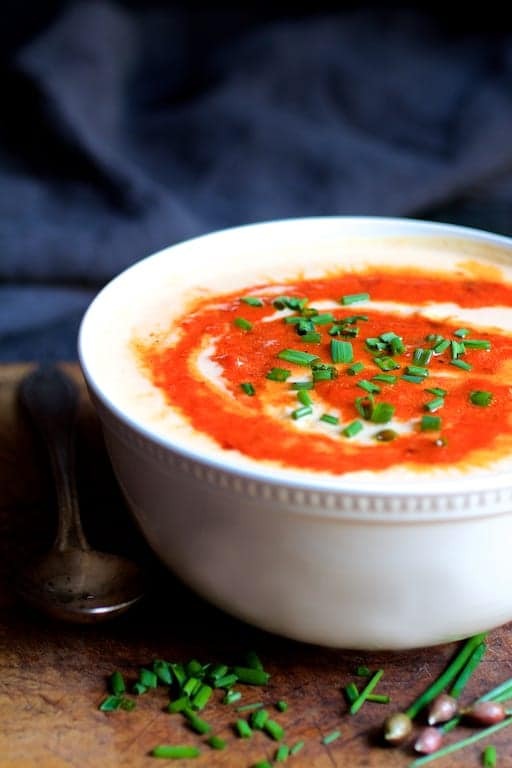 Creamy Cauliflower Soup with Gouda Cheese and Roasted Red Pepper Puree is comforting, creamy and the soup to make for a chilly night! I’ve been wanting to share this creamy cauliflower soup with you all winter long. I made it in the fall, we ate half, then the holidays hit and the rest went into the freezer. I’ve been thinking about this soup ever since and I made it just under the wire! Happy Spring!! We’ll eventually get to what’s in the freezer, but I sure wasn’t going to wait until next fall to share this wonderful soup with you. First of all, I LOVE a soup that takes no chopping skills whatsoever. Simply chop the fresh ingredients, cook, simmer until everything is tender and then puree. The result is smooth, silky and refined like this! 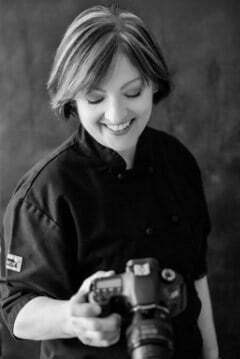 Do any of you remember the CLASSIC vegetarian cookbook by Anna Thomas entitled The Vegetarian Epicure? She also did The Vegetarian Epicure, Part Two. Both are classics in the annals of cookbook history! 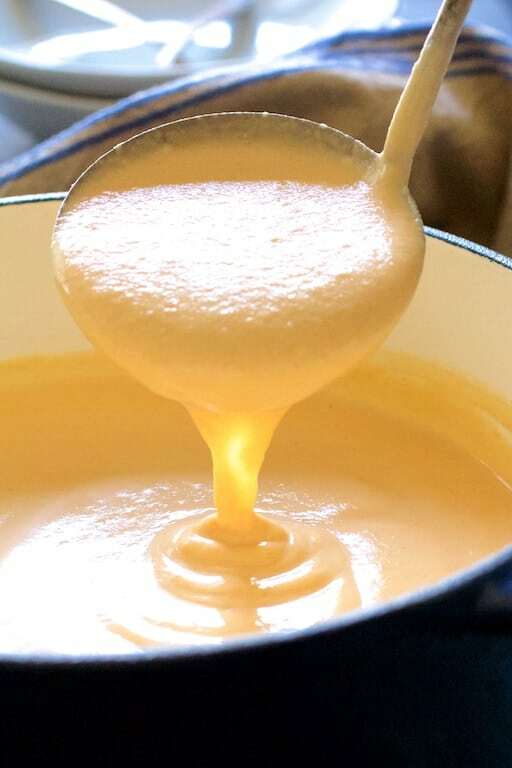 Her Dutch Potato Cheese Soup made with gouda cheese has been a favorite of my husband’s and mine for as long as we’ve been married. For the longest time, that soup was a New Year’s Day favorite of ours. Whenever I add gouda cheese to soup, I think of Anna and that recipe. To make your creamy soup-making life super, super simple, get an immersion blender. What’s easier than tossing everything into a pot, cooking it, and then pureeing it into silky goodness? No transferring to a food processor or blender where you can ugh… burn yourself! Don’t be that person. Get. An. Immersion. Blender. Then, you’ll want to get a mini food processor so that you can whip up this tasty little topping to swirl over the top. Many of your kitchen chores can be done with these two amazing appliances! Chives are one of the first herbs in the spring to poke their flavorful goodness out of the ground. 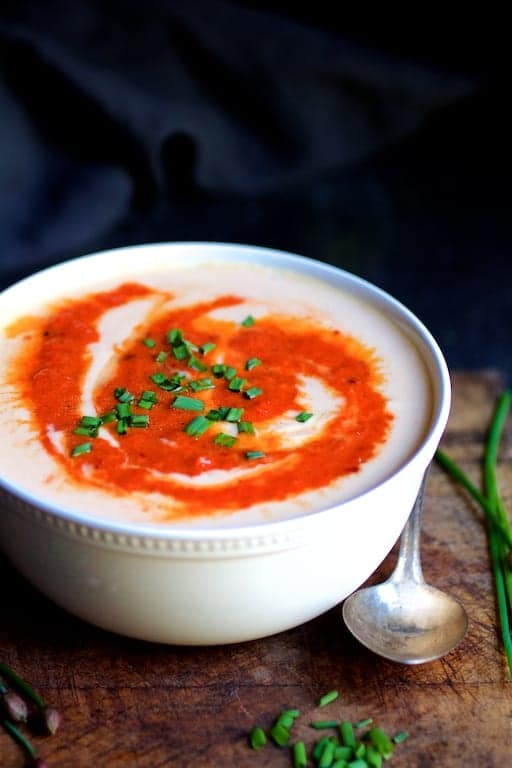 They make the perfect garnish for this creamy cauliflower soup! Be sure to check out these other lovely, creamy soups! SOUP: Heat canola oil and butter over medium-high heat. Add the onion, carrots and celery. Reduce heat to medium-low and cook, stirring often until vegetables begin to soften, approximately 7-8 minutes. 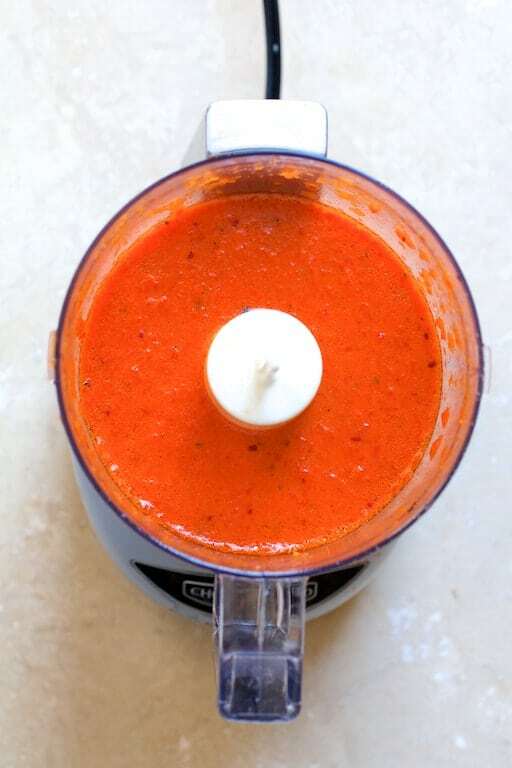 RED PEPPER PUREE: Combine ingredients in a mini food processor or blender. Process until smooth. This soup looks absolutely luscious! Love the mix of veggies and cheese! You had me at gouda! Now that’s a cheese that I don’t thing get enough love. 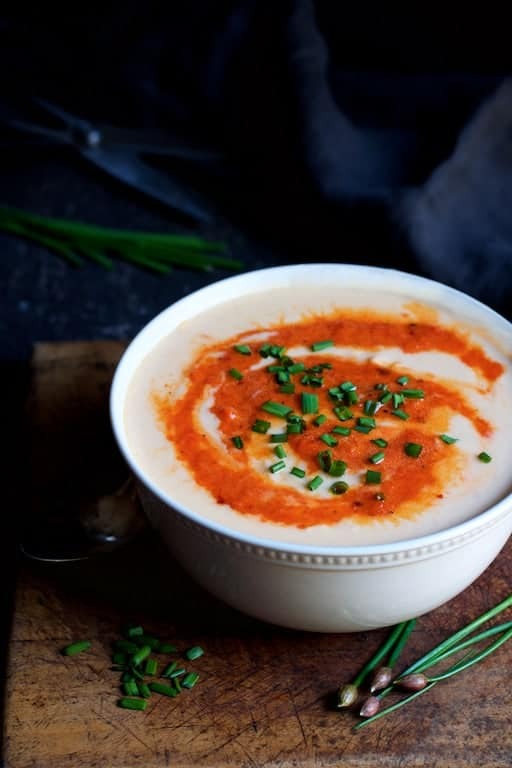 I imagine it melts beautifully into this creamy soup, and then the red pepper puree adds a sweet zing! We love our soups any time of year. This does sound super tasty and I wouldn’t care if it were during springtime weather or even summer. And yes! an emersion blender is a must. We use ours quite a bit — easier than washing out our blender. Thanks, Marisa! I can’t get along without one!